In a small town like Culler, South Carolina, you guard your secrets like you guard your cobbler recipe: with your life. Georgia Ann Monroe knows a thing or two about secrets: she’s been guarding the truth that her best friend Will is gay for years now. But what happens when a little white lie to protect him gets her into a fake relationship... and then the boy of her dreams shows up? I enjoyed this story about small town Culler, SC and its close knit, very small population. Will and Beau are cousins and along with Georgia Ann, best friends. The three amigos all growing up together in a small town. But Will has a secret, so do Georgia Ann and Beau. Secrets that can put pressure on a new budding relationship or on someone not ready to disclose exactly who they are. Then you have the adults in town, experiencing divorce and deceit that rip Beau and Georgia apart when Beau's mom up and leaves town, taking Beau with her. That is, until the wedding of the century brings everyone back to town again to face old loves and old hurts. I think this story really could have gone further into the love triangle aspect and still been a good young adult read. Will's mystery boy is revealed with very little fanfare and I wasn't even sure we knew who he was. The ending was sugary sweet and wrapped the book up nicely, but I guess as a jaded adult, I think it could have used just a little more drama. Still, a sweet and nicely written story of small town misconceptions and revelations. The Sweetheart Sham will be sure to please young adults looking for a warm and fuzzy story, without too much angst, featuring second-chance-romance and a fake relationship tropes, as well as adding an LGBTQ twist. The southern setting was a nice change of pace, with the dialect and accent, gossipy townsfolk, and the mentality of the locale, giving a touch of down-home humor. Georgia Ann is a Southern Belle, a daughter of a founding family from Culler, South Carolina. There are social rules she must abide by, with gossip and pressure to do as those in the town wish from her. She’s licking her emotional wounds in private, suffering from the abrupt end of a relationship no one knew existed. Instead of worrying about herself, Georgia Ann focuses on her best friend, Will, by pressuring him to come out of the closet, while simultaneously becoming his beard within a fake relationship to hide his budding, real relationship with another in-the-closet boy. Beau is Georgia Anne's one who got away, having left the area abruptly due to the divorce of his parents. Angsty, brooding, and wounded, young adults and those young at heart will surely swoon over Beau. After having been gone for quite some time, Beau returns home for the summer to attend his cousin's wedding. Georgia Ann's mother is planning the wedding of the summer, with Georgia Ann having to be her helper. With her faux relationship with Will, and the return of his cousin, Beau (the secret one who got away), The Sweetheart Sham has all the juicy, sweet, and charming elements sure to please readers. I'm on the fence with the writing style, unsure it it's a good fit. I'm curious to read the next book in this series, to see whether or not it was the writing style, my mood, or the subject matter. I do recommend, but suggest downloading the sample to determine if the writing style suits with your reading tastes. I need to voice something that rubbed me slightly wrong with the LGBTQ theme. I understood Will's reluctance to come out in a small southern town, especially with the pressure of being a founding family's son. While I appreciated Georgia Ann supporting Will in his decisions, I felt her pressuring him to come out was in poor taste. For the first few chapters, she was so hyper-focused, turning most inner monologue and dialogue shared with Will, into her warning him/threatening him/making him promise to come out/thinking about how she wished Will would just come out already. While this plays into the overall premise of the story, with such sensitive subject matter, I felt Will's story should have been voiced only by Will – not as if Georgia Ann had ownership in Will's journey. While I'm thrilled the LGBTQ community is popping up in mainstream fiction, Will's coming out story belongs solely to Will. Just my two cents from a member of said community. Danielle Ellison is a nomad, always on the lookout for an adventure and the next story. In addition to writing, she’s the founder and coordinator of the NoVa TEEN Book Festival. When she’s not busy with books, she’s probably watching her favorite shows, drinking coffee, or fighting her nomadic urges. She is newly settled in Oklahoma (for now) with her cat, Simon, but you can always find her on Twitter. 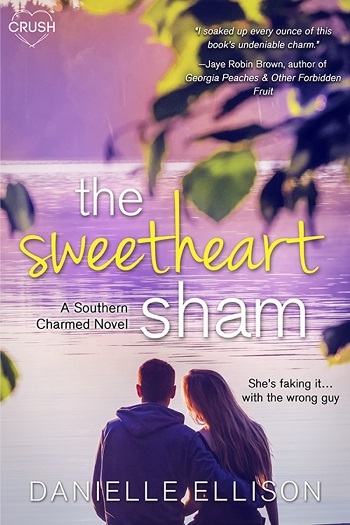 Reviewers on the Wicked Reads Review Team were provided a free copy of The Sweetheart Sham (Southern Charmed #1) by Danielle Ellison to read and review.